On October 7, 2008 (100 years since the first Model T was introduced) a new limited hard cover book became available for sale at the Hershey Flea market (RWM 22-26). * Special handling delivery time for a country with a distribution agent is dependent on inventory availability and other factors ï¿½ Contact Carl Pate for details. All mailing of books from the US is by the United States Postal Service. Mailing of books by agents will be through the country carrier of their choice. So far the book has readers in Australia, Canada, England, Hungary, Netherlands, Sweden and the United States. 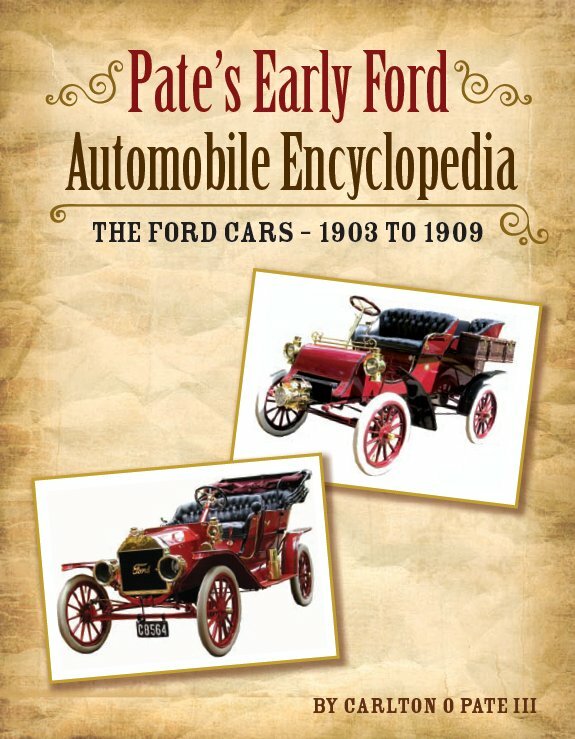 Information in the book includes ï¿½ Characteristics of each early Model Ford; Production and Sales Volumes by Model; Serial number information and where to find it on the car; Changes to Ford Models over the early years 1903 - 1909; Where the Model T came from; Running and maintaining an early Ford car; Stories that surviving cars can tell. Book appendix DVD is secured to the inside of the back cover and disk contains over 2,800 files of historical information and pictures. Included are 3 short videos of the smallest, largest and most produced early Ford cars during the period.